Oakland Police have released these photos of persons of interest in the shooting death of musician Emilio Nevarez. 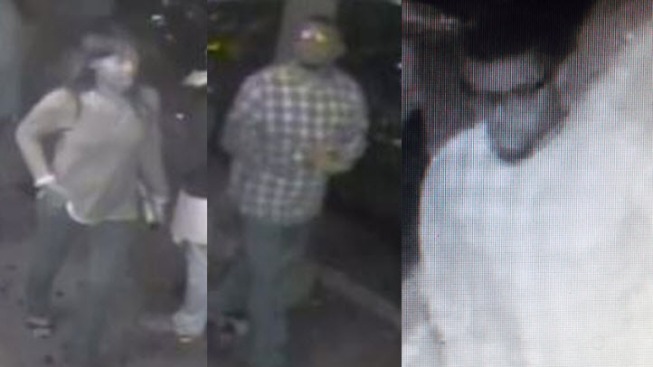 Oakland police are asking for the public's help in identifying a trio and a suspect vehicle in the fatal shooting of a musician outside a downtown nightclub in April 2015. Emilio Nevarez, 26, a Berkeley-based bass player and vocalist for the punk rock trio the Lucky Eejits, was outside the Golden Bull bar at 412 14th St. at about 1:15 a.m. on April 5, 2015, loading up the band's equipment after the show when someone on the street opened fire during an argument. The bullets struck Nevarez and one other person there. The second victim survived, but Nevarez was hit in the neck and died at the scene. Police said Nevarez wasn't the intended target of the shooting. Oakland police on Tuesday released photographs obtained from video surveillance footage in the area that show the suspect vehicle and two people of interest who were with the suspect during the evening of the shooting. Investigators said the car appears to be an early 2000s Mercedes-Benz four-door silver sedan S-series, either a 430 or 500. Police said they want to find people who witnessed the shooting, saw the suspect or suspects fleeing from the scene afterward, and can provide more information about the suspect vehicle. Anyone with information is asked to call Oakland police at (510) 238-3821 or Crime Stoppers of Oakland at (510) 777-8572. The reward for information leading to the arrest of the suspects in the case was $35,000 as of last September. Police didn't provide an updated total Tuesday, but said Oakland-based Pet Food Express has put up a $5,000 reward for information leading to an arrest in Nevarez's death.